This weekend, we're doing two pictures for the captionfest. 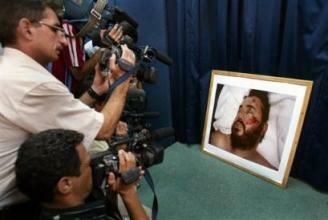 Here's the original of the first: "TV cameramen film a photograph displayed at a press conference in Baghdad, Iraq purporting to show the body of Abu Musab al-Zarqawi, the al-Qaida-linked militant." 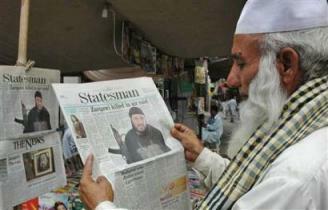 Second: "A Pakistani Muslim reads a newspaper splashed with headlines of the killing of al Qaeda militant Abu Musab al Zarqawi in Peshawar June 9, 2006."